The abstract of this article states that physical training and "particularly eccentric training, appears to be the treatment of choice for patients suffering from patellar tendinopathy." They write that "strong evidence was found for the use of eccentric training to treat patellar tendinopathy." But, they pointed out that there was only "limited evidence" found for surgery, sclerosing injections, and shockwave therapy. Purdam CR, Jonsson P, Alfredson H, et al. A pilot study of the eccentric decline squat in the management of painful chronic patellar tendinopathy. British Journal of Sports Medicine. 2004 Aug;38(4):395-7. This article indicated that eccentric exercises helped to reduce pain in a small group of people with patellar tendinopathy. 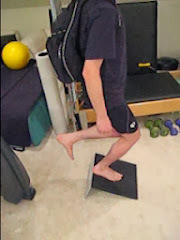 Six out of eight patients who performed eccentric training on a decline board returned to their sports and showed a significantly reduced level of pain over a 12 week eccentric exercise program. Bahr R, Fossan B, Løken S, et al. Surgical treatment compared with eccentric training for patellar tendinopathy (Jumper's Knee). A randomized, controlled trial. Journal of Bone and Joint Surgery. American volume. 2006 Aug;88(8):1689-98. This article is noteworthy in two respects: 1) it's in a surgery journal and 2) the article's conclusion is that there was no advantage in surgical treatment for patellar tendinopathy compared with eccentric strength training. The authors recommended that eccentric exercises be tried before one contemplates surgery. They write, "We believe that eccentric training, a low-risk, low-cost option, should be tried before surgery is considered." These were the results after 12 months for the 20 bad knees in the eccentric training group: 7 knees no longer had symptoms; 8 had improvement, but continued to have some symptoms; and 5 had no improvement. So, 75% of the knees had full or partial improvement over that period. These subjects had an average duration of symptoms before enrolling in the study of nearly 3 years, with a range of 6 months to just over 8 years. The protocol in this study had participants add weight in a backpack in 5-kilogram (ll pound) increments when the subject's pain was low. In my view, after my own trial-and-error approach, this level of weight increments is very, very aggressive and substantially more than the increments I recommend. (I recommend only a 1/2 pound increase every four days.) I wonder if the study would have shown better success for the participants with partial or no improvement had the weight ramp-up been much more gradual. Jonsson P, Alfredson H. Superior results with eccentric compared to concentric quadriceps training in patients with jumper's knee: a prospective randomised study. British Journal of Sports Medicine. 2005 Nov;39(11):847-50. During the period of this study, eccentric exercise, but not concentric exercise, significantly reduced tendon pain during activity and improved function in athletes with chronic painful jumper’s knee (i.e. patellar tendinosis.) The exercise in each case was performed on a slant board. Wilson JJ, Best TM. Common overuse tendon problems: A review and recommendations for treatment. American Family Physician. 2005 Sep 1;72(5):811-8. This article reviews many kinds of treatment for tendinopathy. It recommends eccentric exercises for patellar and achilles tendinosis. Peers KH, Lysens RJ. Patellar tendinopathy in athletes: current diagnostic and therapeutic recommendations. Sports Medicine (Auckland, N.Z.). 2005;35(1):71-87. This article recommends that conservative therapy for patellar tendinopathy be shifted from anti-inflammatory drug therapy to a rehabilitation strategy which emphasizes eccentric tendon strengthening. Jensen K, Di Fabio RP. Evaluation of eccentric exercise in treatment of patellar tendinitis. Physical Therapy. 1989 Mar;69(3):211-6. An early experiment indicates that eccentric exercise may be an effective treatment for patellar tendinitis. Most other experiments would be conducted after the year 2000. Stanish WD, Rubinovich RM, Curwin S. Eccentric exercise in chronic tendinitis. Clinical Orthopaedics and Related Research. 1986 Jul;(208):65-8. This article from 1986 is one of the earliest in a medical journal recommending eccentric exercise for chronic tendinitis. The researchers recognized that eccentric loading has the ability to disrupt tendons, for the better or for the worse. An abstract of the article summarizes a key point: "In order for the healing tendon to be adequately rehabilitated, the treatment program must include specific eccentric strength rebuilding exercises." Other researchers would conduct experiments in later years to show that eccentric exercise can be beneficial for chronic patellar tendinitis.